New York City is known for museums, nightlife, historic sites, parks, and shopping. Your plan includes some of its best attractions: take in the pleasant sights at Central Park, appreciate the history behind Statue of Liberty National Monument, admire the striking features of Rockefeller Center, and make a trip to Empire State Building. To see maps, ratings, where to stay, and more tourist information, use the New York City road trip tool . The Route module can give you travel options from your home to New York City. In April, daily temperatures in New York City can reach 62°F, while at night they dip to 47°F. Finish your sightseeing early on the 27th (Fri) so you can travel to Washington DC. 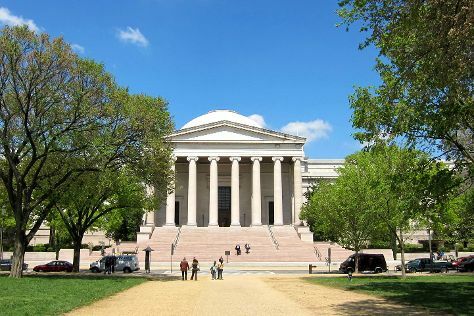 Kick off your visit on the 28th (Sat): admire the masterpieces at National Gallery of Art, examine the collection at National Air and Space Museum, then pause for some photo ops at Washington Monument, and finally pause for some photo ops at Lincoln Memorial. Get ready for a full day of sightseeing on the 29th (Sun): explore the activities along Tidal Basin, then pause for some photo ops at Vietnam Veterans Memorial, and then get a sense of history and politics at White House. To find photos, more things to do, traveler tips, and tourist information, use the Washington DC trip site . You can fly from New York City to Washington DC in 3.5 hours. Other options are to take a train; or drive. Traveling from New York City in April, expect nights in Washington DC to be about the same, around 49°F, while days are somewhat warmer, around 69°F. Wrap up your sightseeing by early afternoon on the 29th (Sun) to allow time for travel to San Francisco. On the 30th (Mon), take in the views from Golden Gate Bridge, then head off the coast to Alcatraz Island, and then take a leisurely stroll along Fisherman's Wharf. To see reviews, maps, other places to visit, and more tourist information, you can read our San Francisco online holiday maker . Traveling by flight from Washington DC to San Francisco takes 7 hours. Alternatively, you can do a combination of train and flight; or drive. Due to the time zone difference, you'll gain 3 hours traveling from Washington DC to San Francisco. In April, plan for daily highs up to 67°F, and evening lows to 51°F. Wrap up your sightseeing by early afternoon on the 1st (Tue) to allow time for travel to Newport Beach. For traveler tips, where to stay, ratings, and other tourist information, refer to the Newport Beach online trip planner . Getting from San Francisco to Newport Beach by combination of flight and bus takes about 5 hours. Other options: do a combination of train, flight, and bus; or drive. Plan for somewhat warmer nights when traveling from San Francisco in May since evenings lows in Newport Beach dip to 59°F. You'll set off for home on the 2nd (Wed).